And neither are Mom and Dad. I overheard Dad say I’m walking around like a drunk teenager. This stupid thing keeps hitting up against everything and I am NOT happy about having it on. 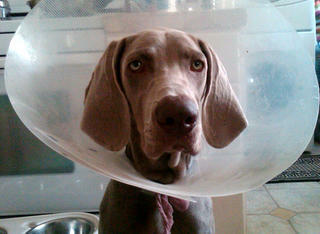 Mom said she may not survive this but I’m the ONE whose having to deal with a contraption on my head – it’s not fair. First they cut into my body and now they expect me to wear this hard hat for 10 days! I can’t run, walk without being on my leash, go potty without being supervised – NO freedom in this house. I already broke the hat and Dad put some duck tape on it. Maybe if I break it again I’ll be free for the next 10 days.